Deer Valley Opens for the 2009/2010 Season! The snow has been falling since mid-October and ski season has finally arrived. Deer Valley Resort was honored to be voted the #1 ski resort in North America by the readers of SKI Magazine for a third year in a row! We are very excited to begin the season with this announcement. Deer Valley Resort started their own lodging division, Deer Valley Resort Lodging and Reservations this past summer. Since the Resort announced the new division in the late spring we now manage seven properties including; Trails End, Black Diamond Lodge, The Lodges at Deer Valley, Stag Lodge, Flagstaff, Shooting Star and Deer Valley Club. Along with those properties Deer Valley also manages over 150 individual units and private homes in the Deer Valley area, allowing one-stop planning for every aspect of your vacation. To kick off the season, we are keeping with tradition and hosting the JUMA Celebrity Ski Classic on Birdseye run both Saturday and Sunday, December 5 and 6, 2009. It is free to the public so we hope to see everyone up here trying to catch a glimpse of a celebrity or former Olympian! Join us opening day for a martini to toast our founder Edgar B. Stern at the new Edgar’s Beer and Spirits (EBS) Lounge in the Snow Park Lodge. At 2 p.m. will be hosting a ribbon cutting and lifting our glasses to honor our founder Edgar B. Stern who sadly passed away last year. The Lounge is a great place to check out Deer Valley’s history and see how Edgar made his way to the “greatest snow on earth”. Stay tuned for more information on events and activities at the Resort. We are looking forward to a very exciting year! See you on the slopes! 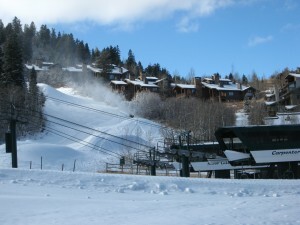 Deer Valley plans to open 7 of 21 lifts and 11 runs on Saturday, December 5, 2009. Think about opening upper Keno and Nabob with the cut off to Little Reb to spread out the traffic on Birdseye. It’s a mess up there on opening weekend. You encounter everything from snowplowers to racers.